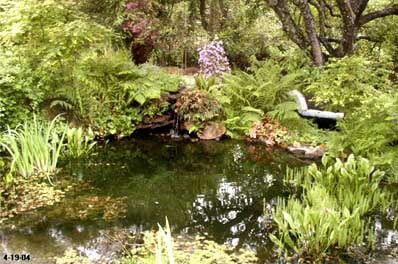 Well, it all got started when I read an article that said you could change your swimming pool into a garden pond. I was tired of throwing chemicals into the pool and taking leaves out. So, we took down the above ground walls of our pool and built a garden pond. It sits in the hole that was left where the deep end of the swimming pool had been. We did this in May of 1996. Little did I know that I was doing everything just right for the dragonflies. We hadn't had the pond there but a day or two when a gorgeous big red dragonfly arrived. My 12 yr old niece had come to help us complete the pond. At first she was afraid of him, but I took her by the hand and he let us get so close that we could see his abdomen expanding and contracting with his breathing. We were completely taken in by his gorgeous eyes and his general beauty and he became our pond mascot. That's really how it all got started, with that Flame Skimmer’s (Libellula saturata) arrival. When other dragonflies began coming to the pond, I really couldn’t help but pay attention. I had been a birder, so it was only natural for me to want to identify and list them. I opened my California guide to insects, and the Audubon field guide to insects, and it quickly became apparent that I had more species of dragonflies at the pond than either of those books showed for our area in California. I thought, "I'll go to the library and find out more!" But there weren't any guides to dragonflies there. I went to bookstores, but there weren't any dragonfly guides there either. I finally found my answers on the Internet: Ron Lyons had compiled and published on-line a list of the dragonflies in California. Taking those dragonfly names, which he obtained from research done by none other than our own Dennis Paulson and Rosser Garrison, I did a search on the Internet again. I would find a site where somebody had taken pictures of a species, often Blair Nikula and Jackie Sones way across the states in Cape Cod. Then I'd save the image on my computer and print the image out for myself on paper along with the name of the dragonfly and any information I found out about it. That's how I ended up making myself my own personal dragonfly guide. That first year many a page had only a name with no information or photo. That was in 1996. The Internet was young then. I found Roy Beckemeyer on-line and he sent me hand-outs about dragonflies. 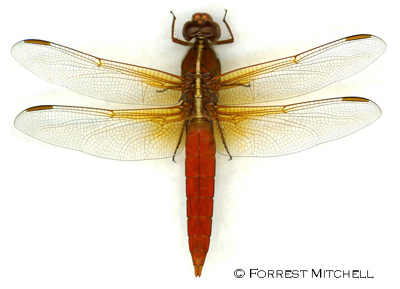 Forrest Mitchell and James Lasswell in Texas began live scanning dragonflies and I remember waiting 10 minutes to watch that Neon Skimmer (L. croceipennis) download. It was so exciting!! Then Dennis Paulson put up his scans of mostly Western dragonflies and I was able to learn so much more. So, by 1998, we were searching in the mountains for species that don't occur in the valleys, and in the desert we saw other species. There were some that were more eastern and some that were more western in their distribution. We went to all those places and discovered so much. My husband and I were both having a blast. It was so much fun. In the summers we chased the dragonflies all over and during the winters I studied about them. I learned so much (“learning keeps you young”). Soon I started attending the “Fourth of July Butterfly Counts” and other such events as a way to get into more waterways. Folks would see me with my Ode-guide binder and I started getting requests to make copies of it. But I couldn’t do that as the images in it weren’t taken by us. Now, I realized that others wanted to learn about the dragonflies too. So just before our youngest son, Jody Biggs went off to college, I had him show me how to create a web site. I was a teacher and it was just natural for me to want to share the knowledge I was gaining. 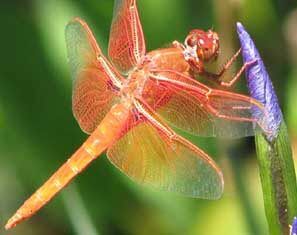 I began creating a Web site for the Dragonflies of California and that's what I did all that winter. Little did I know it would take over my life and that I would become an author! I began the Web site by adding common names to the list of scientific names that Ron Lyons had compiled. These names didn't even exist before November of '96. Our far-sighted group, the DSA (Dragonfly Society of the Americas) didn't want to have happen what had happened with butterflies and plants - where wherever you went there's a different common name for each species. So the DSA put together a naming committee, which came up with names for all the dragonflies in the United States, and then the committee came back to the membership, which voted on them. The selected names are working beautifully and I was able to use them both on my Web site and in my book. The committee tried to pick names that went with each species' appearance or behavior. An example would be the Widow Skimmer. It has black on the inside half of its wings as if it were wearing a cloak for mourning. I think that the naming committee was very successful. A least one name the committee chose was misleading though. The California endemic, Zoniagrion exclamationis, was named the Sierra Damsel. To out-of-staters, that name conjured up images of California. But to Californians, it brought to mind the Sierra Nevada Mountain range. Not knowing that Dennis Paulson, who had become my mentor, was on the naming committee, I complained to him that I had had great difficulty in making my very first independent dragonfly identification as I was looking at a valley species, so I’d not even bothered to look up what a “Sierra” damsel might look like. He then said something to the effect of “I’m on the naming committee and this first year the committee will entertain any suggested changes.” He encouraged we Californians to come up with a more suitable new English name. So, we Californians (myself and husband Dave Biggs, Tim Manolis and Andy Rehn) threw around names all winter. Each name we chose though was already taken (they like dappled shade, but Shadow Damsel was already in use for Palaemnema domina). 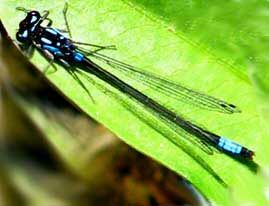 Finally, we thought, it has two blue exclamation marks atop its thorax and its scientific name includes exclamationis, why not name it the Exclamation Damsel? It was a mouthful, but we submitted that name to the committee. The vote was not unanimous, but it prevailed and now I’d had a part in naming one of these gorgeous creatures. This was exciting. Now I started receiving email messages from viewers of my web site who were also interested in dragonflies. One of them was Tim Manolis in Sacramento. Now I had someone to Ode with. Off we went!! I kept working on the website and it grew and grew. Every time my friends would call or stop by, that’s what they’d find me doing. Soon, teasingly, they asked, “When will it be a book?” Well, that put the idea in my mind, and come the winter of 1998, when Ode withdrawal began, I found that working on a guide was just the tonic I needed. The first version of my Common Dragonflies of California was only 77 pages long and totally made on our home computer and printer. I think I sold 45 copies to folks thru the website who’d asked for it. Dennis Paulson was kind enough to do the scientific review of it for me, and cautioned me not to be discouraged when I saw all his red ink on the review. That winter I looked for a publisher, but didn’t find one. In 1999 Dave and I formed our own publishing company: Azalea Creek Publishing (the name of the creek at the back of our property). I felt I knew what a beginner needed and expanded the book to 96 pages while still keeping it pocket-sized. Bob Behrstock had become an eFriend, and he contacted me about coming to California to photograph our Odes. I said I’d be glad to show him around and I had him send me a list of ‘target’ species. It turned out to be a wonderful encounter in many ways for I soon realized that our own photographs just weren’t of sufficient quality for a guide. When I timidly asked Bob if I could use some of the photos he took during his visit, he said YES!! The quality of the guide grew tremendously! Later, Bob asked me what was my “totem” ode? I had to think about it, but soon realized that it was that very first species that I identified on my own, the Exclamation Damsel. And you may have noticed that I always use two ! !, not just one!! I became quite busy scanning slides for the book. I had to go to nearby Sonoma State University to do this as we certainly didn’t own a slide scanner. I joined BAIPA (Bay Area Independent Publishers Association) and was soon in touch with a printing company in China, having learned that almost all color printing was done there or in Germany as the USA printers at the time didn’t have the newest machines. I was able to talk Dennis Paulsen into doing another scientific review and we were in business. Of course, the Flame Skimmer was the cover Ode for the 1st edition. The image had been taken by my brother, Bob Claypole, back in 1974. Little did he or I suspect how many people would see that image!! But, how was I to know how many copies to make? I met with the owner of the local bookstore, showed him my mock-up copy and asked him to predict how many copies he thought he could sell in a year. Then I multiplied that # by the 58 counties in California and decided on 5000 copies. We took $$ for the printing out of our savings account and crossed our fingers. Well, the rest is history. We sold those first 5000 copies the first year and we’ve now sold over 17,000 copies of that little guide, its 2nd edition and the expanded SW edition, plus we’ve published a Dragonfly Coloring Book (with art by Tim Manolis), a Greater Southwest Guide and we’ve even published a few books by others that weren’t even Ode-related. BTW: My 1st guide turned out to be the 2nd best selling non-fiction book for the local bookstore that first year!! Now I travel around not only chasing dragonflies but also giving programs and workshops about them. It’s been a wild ride and I’m still just loving it!! See you at the next DSA meeting! ?